A Spanish composer born January 15, 1956 in Madrid. José Manuel López López followed classes for piano, composition and conducting at the Madrid Conservatory. A pupil notably of Luis de Pablo, Luigi Nono, Horacio Vaggione and Franco Donatoni, he also followed the analysis and composition courses of Olivier Messiaen and Pierre Boulez. He took advanced classes in electro-acoustic composition at the GMEB in Bourges, took part in a Upic seminar at the Cemamu and followed the composition and computer music course at Ircam. The holder of a DEA in music and twentieth-century musicology from the École des Hautes Études en Sciences Sociales, a founder member of Densité 93, José Manuel López López is a teacher, lecturer and the director of the composition workshop of the University of Paris VIII. From 2007 to 2010 he was artistic director of the National Music Auditorium in Madrid. His music has received many awards, notably from the ISCM and the International Computer Music Conference. The Spanish state awarded him the National Music Prize in 2000. His compositions include Diesseits for trumpet, instrumental ensemble and electronics (1993), Concerto for violin and orchestra (1995), Haïkus d’automne for solo voices and instrumental ensemble (1997), Movimientos for two pianos and orchestra, premiered at the Musica festival (1998), Ekphrasis (2001), the opera Les villes invisibles (2006) and Saori first performed by the ensemble 2e2m in 2010. Born in Madrid in 1956, José Manuel López López began his music studies with the piano and entered the Madrid Conservatory in 1973. A scholar of the International Manuel de Falla Course in Grenada, Spain (1981-1982), he was initiated into composition by Carmelo Bernaola, Luis de Pablo and Luigi Nono. On his return to Madrid in 1983 he further studied composition with Anton Garcia Abril, contemporary writing techniques with Luis de Pablo and conducting with Enrique Garcia Asensio. In 1984 he turned towards electro-acoustic techniques with Horacio Vaggione at the Gabinete de musica electroacustica(GME) in Cuenca and attended, in 1985, the second seminar on ‘Music and the computer’ given by Lejaren Hiller. At the same time he was composing Sámaras for vocal quartet and instrumental ensemble, and received the first end-of-study composition prize from the Madrid Conservatory. He then furthered his composition studies with Armando Gentilucci and Giacomo Manzoni and, as a scholar of the Institute for Youth (Instituto de la Juventud), he took part in the classes of Cristobal Halffter at the International Composers’ Campus in Villafranzia del Bierzo. His work A una habitaciòn for a cappella mixed chorus received on this occasion the First Prize in the Institute’s polyphony competition. A teacher of music theory and harmony at the Cuenca Music Conservatory (1985-1986), guest composer at the International Composers’ Campus in Villafranzia del Bierzo, José Manuel López López has amassed awards for Después de los trémolos (subsequently withdrawn from his catalogue) and De sapientia for 21 sopranos a cappella. From 1986 to 1988 he continued his study of electro-acoustic music within the Groupe de Music Expérimentale de Bourges (GMEB). At the Centre Acanthes he took part in the classes for analysis and composition of Olivier Messiaen and Pierre Boulez; he also gave a lecture at the International Manuel de Falla Course in Grenada on La composición musical en España hoy. In 1989 he was awarded a master’s degree in music and technology at the University of Paris VIII on the subject ‘Karlheinz Stockhausen: instrumental and electro-acoustic music’. He then perfected his knowledge of new technologies at a seminar organised by the 'Unité Polyagogique d'Informatique et de Composition (UPIC) at the Centre de Mathématiques et Musique directed by Iannis Xenakis (CEMAMU). In parallel, he obtained a Diploma of Advanced Studies (DEA) in music and musicology of the twentieth century as part of the doctoral programme of the École des Hautes Études en Sciences Sociales (EHESS) and of Ircam. A teacher in 1990 in the music department of the University of Paris VIII, he gave many lectures, notably in 1995 in Paris during Ircam’s Summer Academy, at the University of Toulouse le Mirail, at the Círculo de Bellas Artes in Madrid and at the Centro Gallego de Arte Contemporáneo in Santiago de Compostela. José Manuel López López was also guest teacher at the Summer University of Andalusia (1994), at the Escuela Superior de Musica de Cataluña (ESMUC, in 2001) then, in 2004, at the seminars of Villafranca del Bierzo, in the Catedra Manuel de Falla in Cadiz and at the Universidad Católica de Santiago in Chile. A founder member of the association Densité 93 (2001) and director of the composition workshop at the University of Paris VIII, he greatly increased the collaboration between the two structures. Aware of the importance of cultural and artistic promotion, he was also the artistic director of the National Music Auditorium in Madrid from 2007 to 2010. 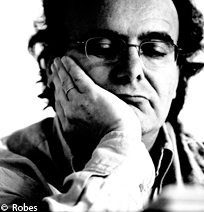 The music of José Manuel López López has won many prizes, notably from the ISCM in 1989, the International Computer Music Conference (1992) and the Spanish state in 2000, that awarded the Premio Nacional de Musica (National Music Prize). Many of his works have been commissions. They include Lo fijo y lo volátil, for piano and sampler, commissioned by the French state (1994); Sottovoce (1995), commissioned by Ircam, first performed at the Centre Georges Pompidou; the Violin Concerto (1995), commissioned by the National Orchestra of Spain, premiered in Madrid; Mettendo he grande oceano in spavento (1997), commissioned by the Gulbenkian Foundation and the association Nuove Sincronie, first performed in Lisbon. Starting with Aquiléa (1986), José Manuel López López began to superimpose independent temporalities, giving the illusion of different levels of simultaneous flux. He effects dynamic and harmonic contrasts to support the articulations, and deals with tone-colour by the fusion of highly proximate registers and by the incorporation of micro-intervals. Influenced by technological advances, he subjects his musical material to decomposition and recomposition of the sound by digital synthesis. He generally uses rich tone-colours, notably in Lituus (1991) with its brassy sounds, and builds certain blends of perception in which the musical colour is enriched with new features, each sound mass possessing its own colour. José Manuel López López works with the other arts. He finds inspiration in literature, particularly in texts of the eleventh century by Pedro Alfonso (De silentio; Sottovoce); he uses traditional tales (Pluma de Hu, 2000), and contemporary texts, for example, by Italo Calvino for his opera Les villes invisibles. In addition, during a trip to Japan, he found great pleasure in reading haiku. These resurfaced in the composition of Haïkus d'automne (commissioned by the French state, 1997), Viento de Otoño (1998) and Le parfum de la lune (2003). In 2005 Chinese poetry gave birth to El arte de la siesta, the result of a blend of poetic and poîetic feelings. Finally, José Manuel López López has collaborated with the painter José Manuel Broto for Estudios sobre la modulación métrica (2003), and also with the cinema/video artiste Pascal Auger for Octandre (2001) and La celesta (2004). It was in La noche y la Palabra (2004) and Les villes invisibles (2006), his two multimedia operas, that he exploited video in the most accomplished manner. Texte de José Luis Crespo "A una mujer saharaui"
Création : 2004 – Ensemble Soli tutti, direction Denis Gautheyrie. Création : 30/04/2002 – José Luis Estellés, Orchestre et Chœur de la Comunidad de Madrid, direction José Ramón Encinar. Espagne, Madrid, Auditorium national de musique. Création : 19/06/2003 – Anne Mercier, direction Dominique Dournaud. Création discographique : Alberto Rasodo, Deutsches Symphonie Orchester Berlin, direction Johannes Kalitzke. Création : 06/05/2007 – Quatuor Arditti. Espagne, Valence, Palais des Arts. LÓPEZ LÓPEZ José Manuel. Karlheinz Stockhausen : musique instrumentale et électroacoustique. Maîtrise en musique et technologie. Paris : Université Paris VIII-Saint Denis, 1989. LÓPEZ LÓPEZ José Manuel. Mapa y territorio : Partitura y sonido. Resvista Transversal Ajuntament de Lleida, 1999.